Escallonia Iveyi, a drought tolerant hedging plant. Widely used as hedging plants Escallonia Iveyi is a hybrid, E. bifida x E. exoniensis. One of the better known varieties of this large genus of plants with a number of species and cultivars being offered by wholesale growers. Used in gardens and landscaping for many years, this is a versatile plant that has never gone out of fashion. Flowers are fragrant and contrast well against the glossy green foliage. The popular Escallonia Iveyi is used mainly for hedging, reaching around 3m in height with a similar spread. Deep green foliage undulating on the margins and attractive white flowers in summer. Foliage is rounded and attractive through the year. The cultivars offered by growers vary in flower color and height. All are easy care and all work well as hedging plants or low border plants. Escallonia Iveyi spacing for a dense hedge is best at between 70 cm and 1m. Easy to prune and excellent in confined spaces. Soil – Well drained humus rich, however tolerant of both sandy and clay soils. Pruning time – After flowering. Pink Pixie – Dark green foliage crimson pink flowers reaches around 80cm in height. Apple Blossom – Pale pink to white flowers, deep green foliage reaches around 2m in height. Red Elf – Brilliant red flowers and good green foliage, reaches around 2m in height. 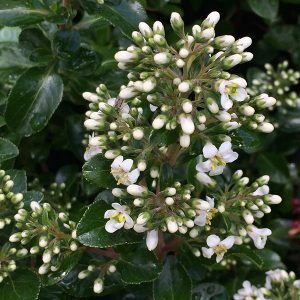 As landscaping plants Escallonia are popular due to the low water requirements, ability to grow well in coastal conditions, ease of pruning and general hardy nature. Sold by growers as potted specimens and also in trays of rooted cuttings for mass planting and hedging.